This mod isn't compatible with mod X. Can you fix it? If I update this mod to a new version, will I lose all my progress on it? You WILL NOT EVER lose your skills unless you load up your world without the mod installed or have it incorrectly installed. That is literally the only way you will ever lose your progress. ModLoader also modifies the aaa.class. Is it compatible? Yes. I based that class on the one from ModLoader, and added my own code from there. Just make sure to install this mod after installing ModLoader and everything should be fine with that. Has skill X already been suggested an annoyingly large amount of times? Is this compatible with Zan's Minimap? No, but CJB's should work, and some have gotten Rei's to work. Will you make a multiplayer version? There are not any plans to do that at this time, and asking me to do it only makes me want to do it less. When I found out that the experience and leveling coming in 1.8 would not have a use until later, I was pretty disappointed. And now it seems like vanilla skills won't be coming until 1.10. So I decided to take matters into my own hands and make the Level Up! mod. -Every point in Woodcutting increases the chance that chopping a natural wood log will drop extra sticks and/or planks. -For every ore you mine, you will gain a small amount of XP. The amount depends on the type of ore you are mining. -Starting at level 5, you are able to chose a class. There are currently 12 classes (one for each skill, a pattern which I intend to keep when more skills are added). Upon choosing a class, you will gain an instant boost of +10 levels in a certain skill and +5 levels in two others. The skills affected depend on the class chosen. -Additionally, each class has an "affinity" for either mining, crafting, or combat. Mining classes get boosted XP from mining (given after every 3 ores mined), Crafting classes get boosted XP from crafting (given after every 5 crafts that use the "approved ingredients"), and Combat classes get boosted XP from killing mobs (given instantly after killing any hostile mob). -A word of warning: For some items that are worth less XP, using a stack that is below a certain size will yield you no XP at all, and just end up destroying the items. Watch out for this especially with wood and coal. -The Book of Unlearning is an item that can be used to respec your skills and class. Using the Book will consume it, resetting all your skills as well as your class in the process. It will also give you all the skill points you have accumulated back to you, allowing you to allocate them again. It will also let you re-pick your class. -While sneaking, enemies will only detect your presence if they happen to turn and look at you. In other words, if you are sneaking, it is not enough just to get near enemies for them to start attacking you. They must be looking in your direction. -Also, if you attack a mob that has not detected you with a melee attack, you will perform a Sneak Attack for 2x damage. This works with bows too, but the bonus is only 1.5x damage and you must be close enough to your target so that normally they would detect you. -The potency of the buff is determined by how far away the mob spawned from the player's original spawn point (beyond 320 blocks) AND how deep down the mob spawned (below depth 60). The two buffs WILL stack! All skills are capped at 50, and the player's level is capped at 100. Upon death, you retain your skills, but will not get any skill points until you level up past the last largest level that you had died on. 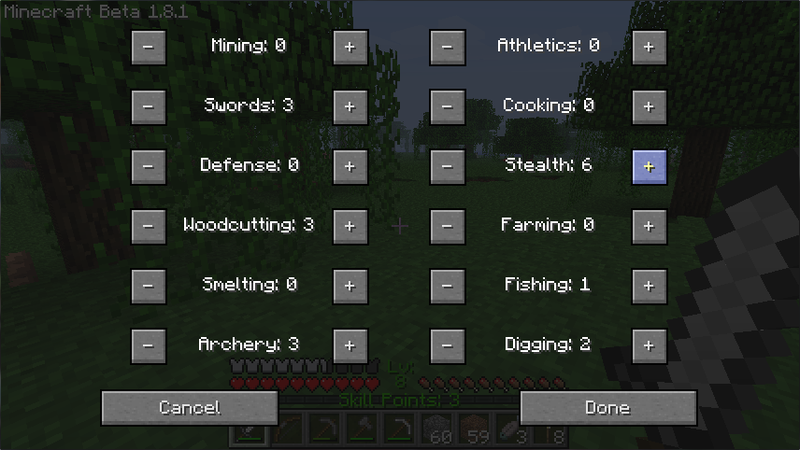 Additionally, this mod displays what level you are on in the GUI (between health and hunger), as well as your number of skill points if you have any. The mod is only for single player Survival mode, and is disabled in Creative mode and multiplayer worlds. 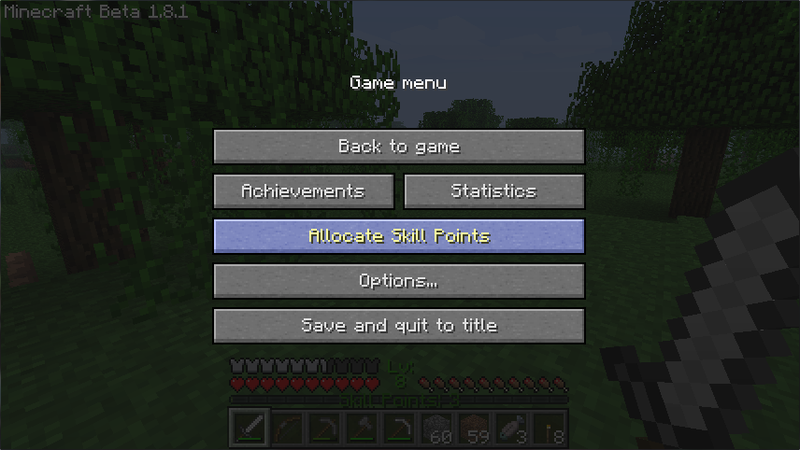 You can only subtract from skills that you added skill points to before pressing "Done." In other words, you cannot "respec" using the minus buttons (try the Book of Unlearning :wink.gif:). **It's effects now apply to any melee attack with any item. However, the damage bonus does not affect anything that deals only 1 half heart of damage, since even at level 50 it would only be increased to 1.5 half hearts of damage, which I floor down to 1 again. **The potency of the buff is determined by how far away the mob spawned from the player's original spawn point (beyond 320 blocks) AND how deep down the mob spawned (below depth 60). The two buffs WILL stack! -Fixed a bug which allowed a skill to be pushed over 50 after choosing a class. -Reworked Digging: You can no longer find loot chests by digging. Instead, there is now a (much greater) chance that a single, random piece of loot will appear when you dig out natural dirt blocks below a y of 60. -Reworked Woodcutting: The insta-chopping trees aspect has been replaced by a chance for extra sticks/planks from chopping natural logs. -Added new mechanic: While sneaking, enemies will only detect your presence if they happen to turn and look at you. In other words, if you are sneaking, it is not enough just to get near enemies for them to start attacking you. There is a "secret" feature with this mechanic. Once someone finds it, I will add it to the mechanic's description. -Really REALLY fixed that 1.1, bug, and this time I'm not lying! YOU MUST INSTALL MC FORGE IF YOU ARE USING THIS VERSION! IT WILL NOT WORK CORRECTLY IF YOU DON'T! DO NOT INSTALL MC FORGE IF YOU ARE USING THIS VERSION! Because the mod modifies many vanilla classes, it may not be compatible with other mods. If you get crashes with this mod and you are using other mods, it is probably a compatibility issue, so please tell me what other mods you are using if you want to report a crash. This modification and its code are copyright PowerUp217 (a.k.a. me). Nobody is allowed to redistribute it (the mod or its code) in any form through any medium without my express permission. Minecraft, it's program, concept, and assets are copyright Mojang AB. Looks Great! Going to try it out! Kudos to you, my friend! <<and Diamonds for the effort! With the minusing thing couldn't u like put all ur points in mining then when u want to fight add them to sword or defense? Still a Kool mod! it is great but can it be a server mod very soon cause my friend's server really wants that leveling thing that notch is gonna add....thank you for letting this out! this is awesome! the only skill I can think of right now is a repair skill. make a use for those iron blocks! it's like the repair skill in the minecraftMMO plugin. right click on an iron block while holding some of the resources to repair it. for one shovel, one resource, one pickaxe, three resources. use wooden planks to fix wood tools. use cobblestone to fix stone tools. use iron to fix iron tools. use gold to fix gold tools. use diamond (once skill level at, say, 25-30) to fix diamond tools. credit: unoriginal idea posted here by me. original idea by Nossr50. Use us! Quickly, noobs! Use us! What class files are modified? EDIT: I think the abj.class will break Zan's Minimap. Finally something new to fuel my addiction until 1.9 is (hopefully) released with leveling. Well a diamond sword two-hits any mob by default anyway, and even at 50 in Swords, it still won't instakill without a crit. Also that is part of the reason I said I wanted to add other ways of getting XP. I guess I didn't really explain that. What happens is when you get skill points and go to the GUI to spend them, you can only subtract from skills that you have added points to at that time. When you hit "Done", your skills get locked in, and cannot be subtracted from. There is no way to "respec." I will add a list of modified vanilla classes to the OP. Unfortunately, there is a lot. This mod is probably not compatible with too many others, especially those that add things to the HUD. I was definitely thinking about Fishing, Farming, and some sort of Athletics skill, which would probably be like your running and acrobatics combined. I also thought about a Crafting skill, but I haven't decided on how to approach that yet. No, you can adjust them when you're in the screen, but once you confirm them you cant lower them again. Great mod, by the way. Hope to see some more skills, but this is a very good start to give the game a bit more depth and reason to stay alive. Dont put too much time into it, since it'll probably be near useless (unless you make better skills than Notch!) when 1.10 comes out. Remember, when you die you lose about 1/3 of your levels! Die at level 6 and only 4 levels of xp drop from you (from 0). Not sure, but I'm guessing that amounts to about half of your xp.